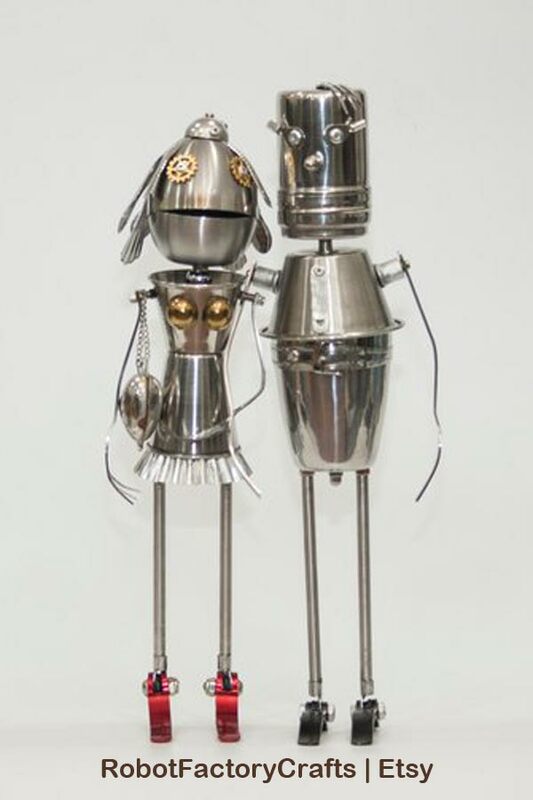 Love garden junk? 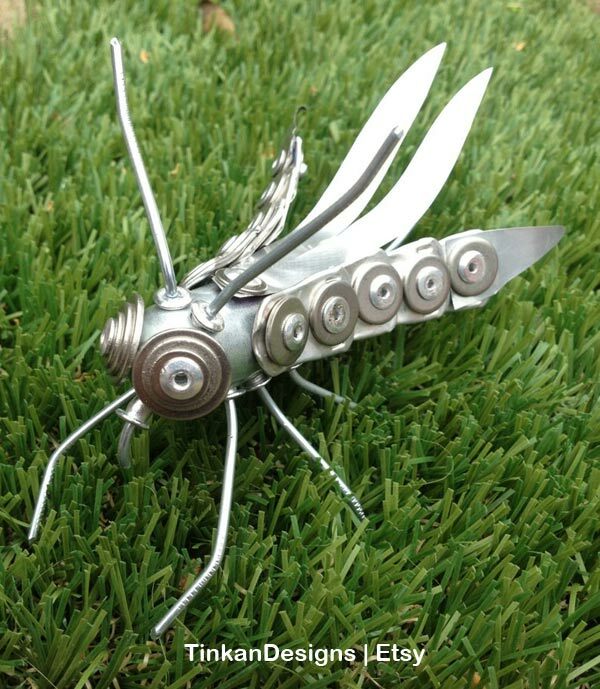 These creations provide great recycled art ideas for your garden or home. They are all from Etsy shops, so you can buy what you love or make your own. 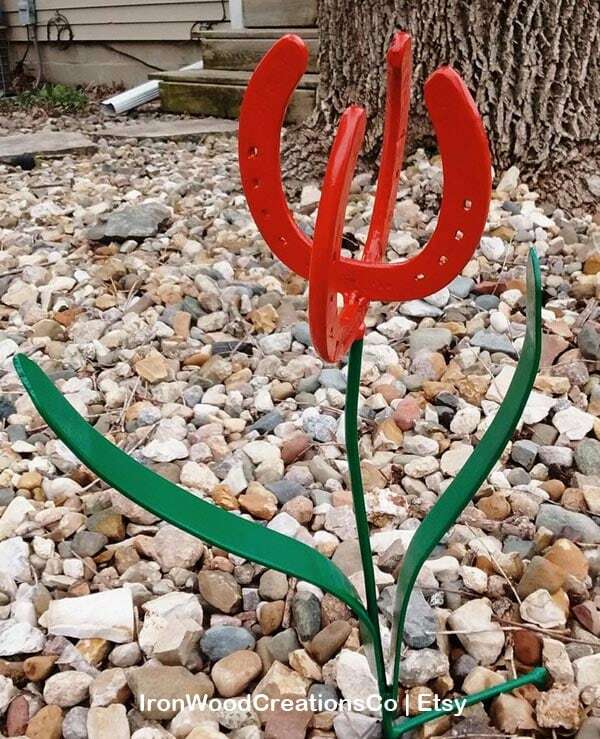 You can also find dozens of DIY garden art and decor projects here. 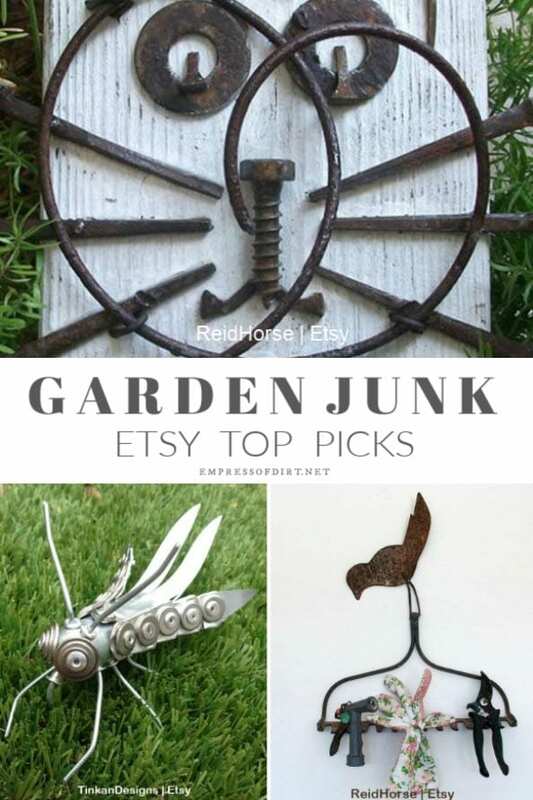 Garden junk is a broad and brilliant category. 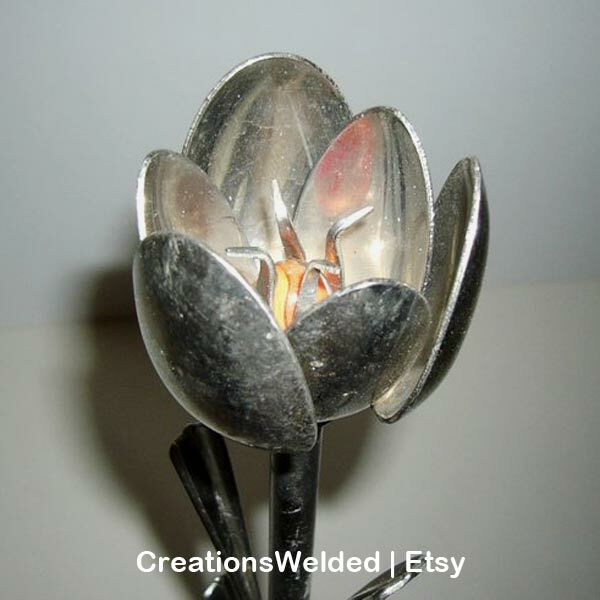 It can mean anything repurposed to decorate or enhance a garden or an artistic expression of something found in a garden. 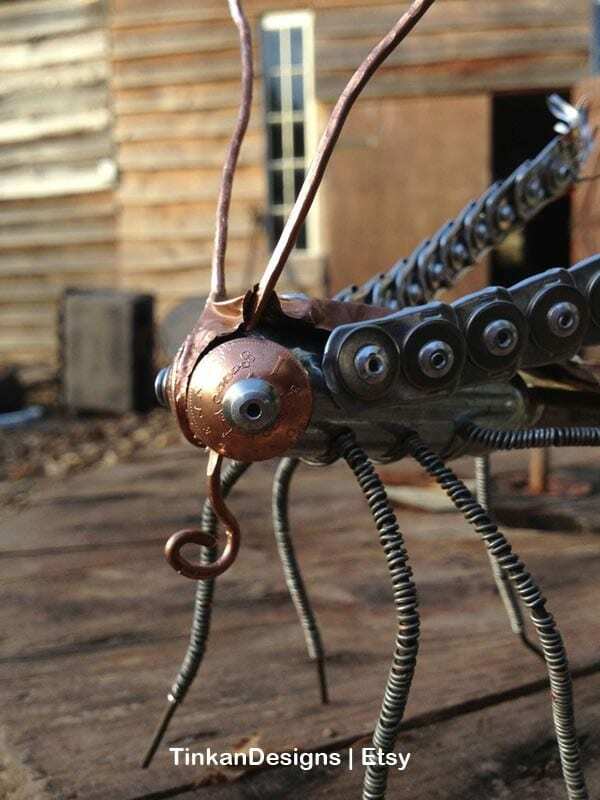 This could be unusual planting containers, old signs, rusty chains or tools, or the re-imagined critters and quirky decor ideas I have shared here. I am a life-long garden junk fan. 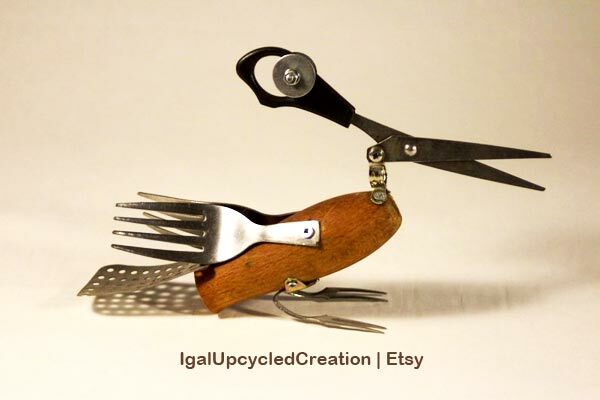 My favourites are the pieces that take ordinary kitchen utensils or workshop tools and re-imagine them as something new. As you browse the ideas, have a look at what they’ve used for the various parts. 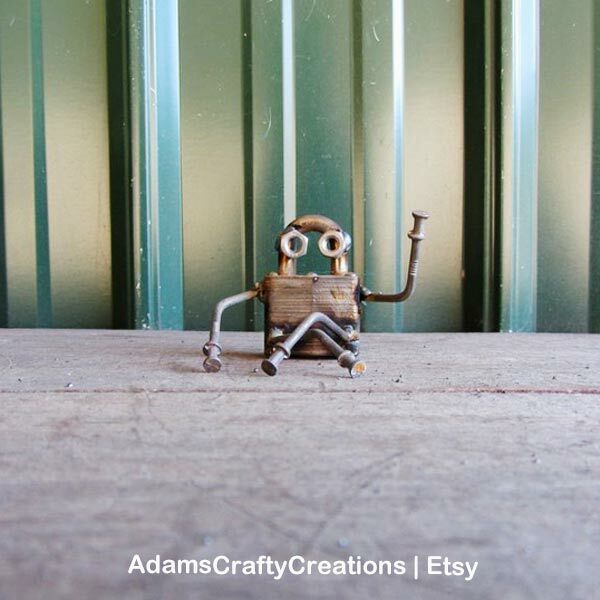 It’s a great way to grab ideas for your own unique creations. Pay attention to the size of the item, and, if it’s not listed, ask the seller before purchasing. Sometimes items seem much larger than they actually are! 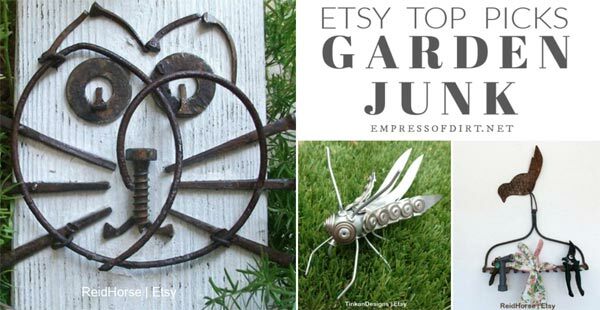 These one-of-a-kind garden junk ideas come from Etsy shops and may have already sold by the time you view them. 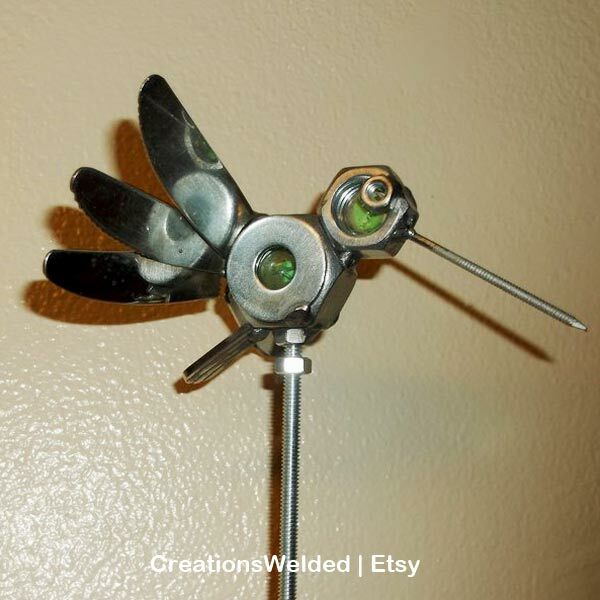 I am an Etsy affiliate and I may receive a small commission at no cost to you if you choose to purchase something. I have listed all of the individual links below. You can also see everything on this favourites list at Etsy. This is one of my all-time favourites! I would love to have a giant version of this in my garden. 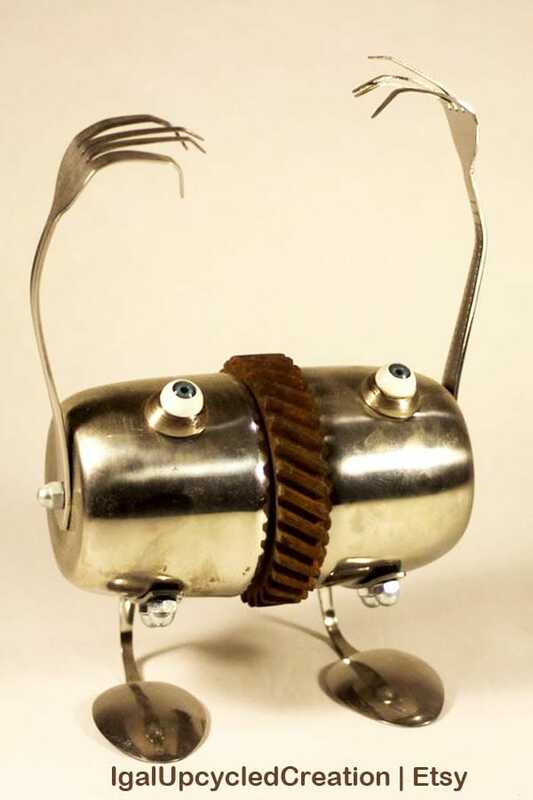 The term garden junk evolved, because, historically, long before trash collection and landfills existed, the garden was the place where people tossed their old junk. 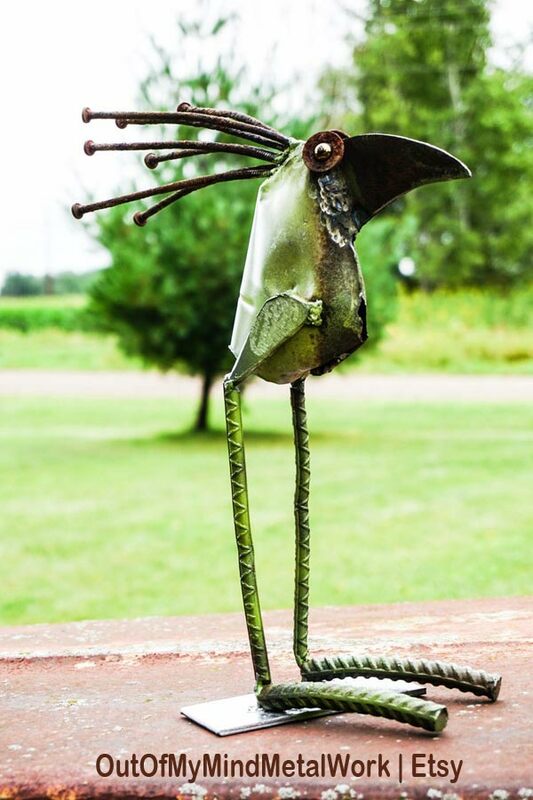 For my own garden art/junk, I’ll put anything outside I don’t mind wearing away with the weather—usually metal, wood, stone, or heavy glass. A quirky treasure like this scorpion would reside in my house. This is just plain cute. You’ve probably seen spoon fish (there are some further down the page), but these knife sharks are extra delightful. This guy is so funny. One tip: if you want to make something with eyes, look for dolls at the thrift shop. The old plastic type often have realistic looking eyes like these ones. 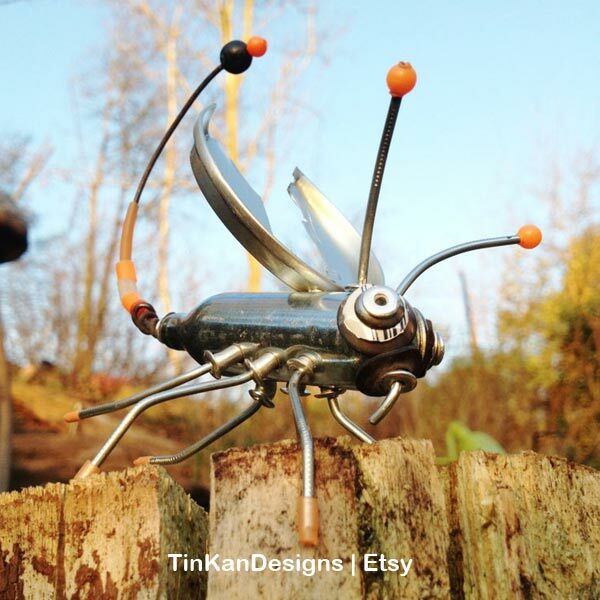 Want More Garden Art Ideas? This guy is just plain majestic. 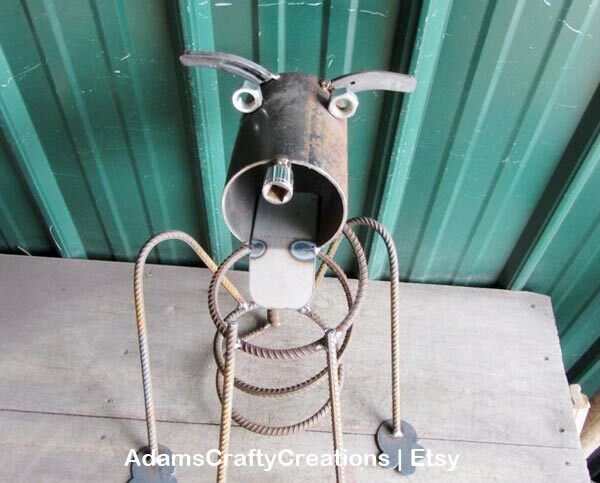 Something like this is best welded and there’s some sculpting involved. 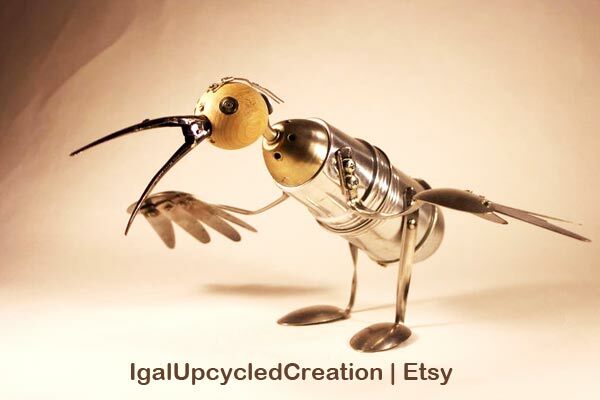 This little guy is made from things I often see in the kitchen utensil basket at the thrift shop. Notice what his legs are made of? Door stoppers and springs. 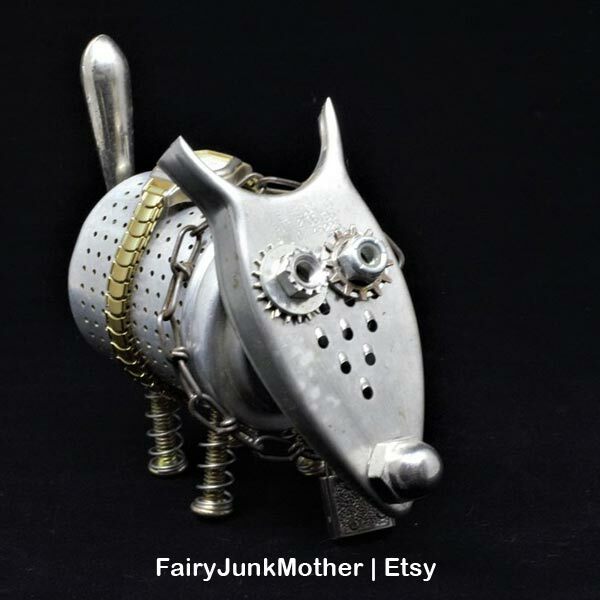 Are you a fan of steampunk art like I am? This guy is seriously beautiful. 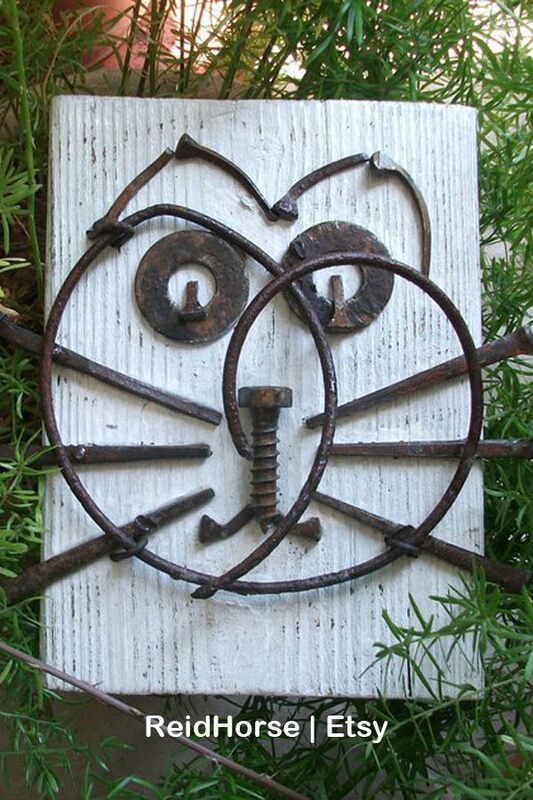 Bike chainrings (the part that the chain engages with) are useful for all sorts of garden art. 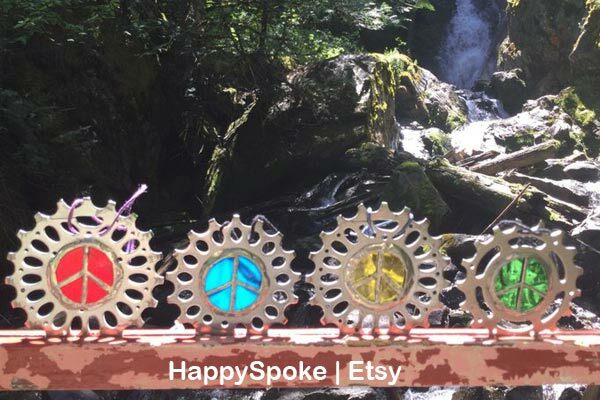 These ones are made into stained-glass decor. I just love goofy little things like this. If this was mine, he’d live on my desk. If you ever see a box of old horseshoes for a low price, nab them! 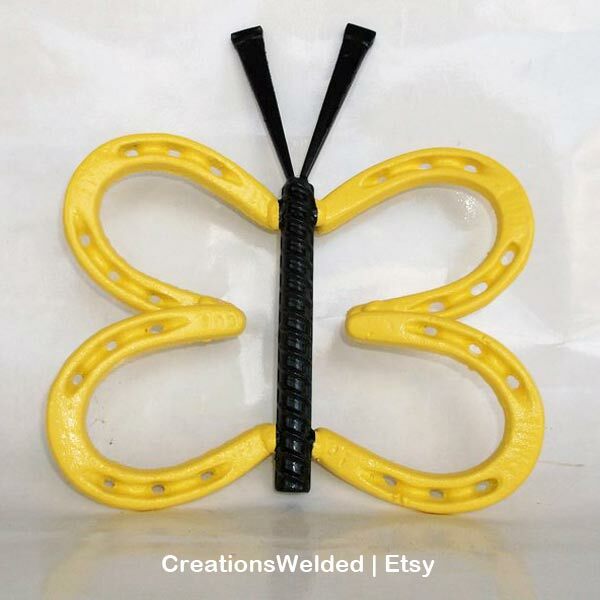 Here they’ve used four horseshoes and rebar to create the butterfly. 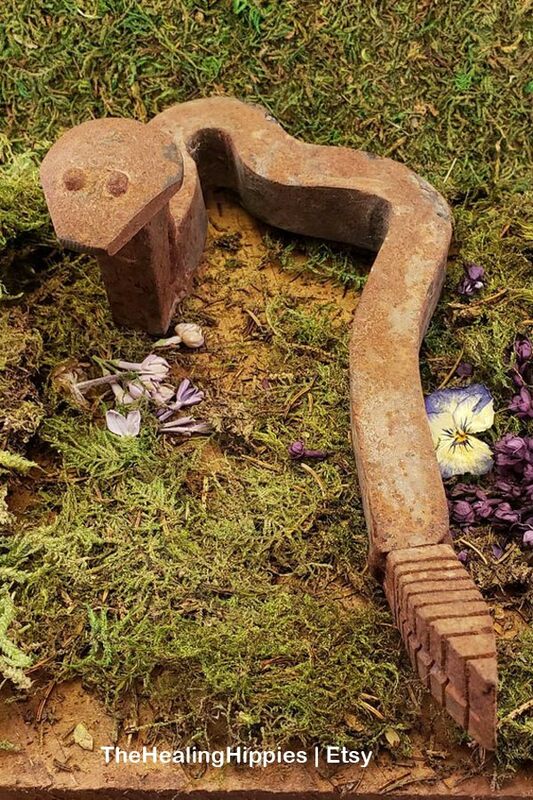 I don’t have snakes in my garden but if I did, I’d like it to be this one. This little work of art uses spoons and a fork with a marble in the middle. While large metal projects require welding, you might be able to make smaller ones using a good adhesive. I use GE II Silicone Sealant for most outdoor projects. With a few tweaks, something like this would make a fun mail box. 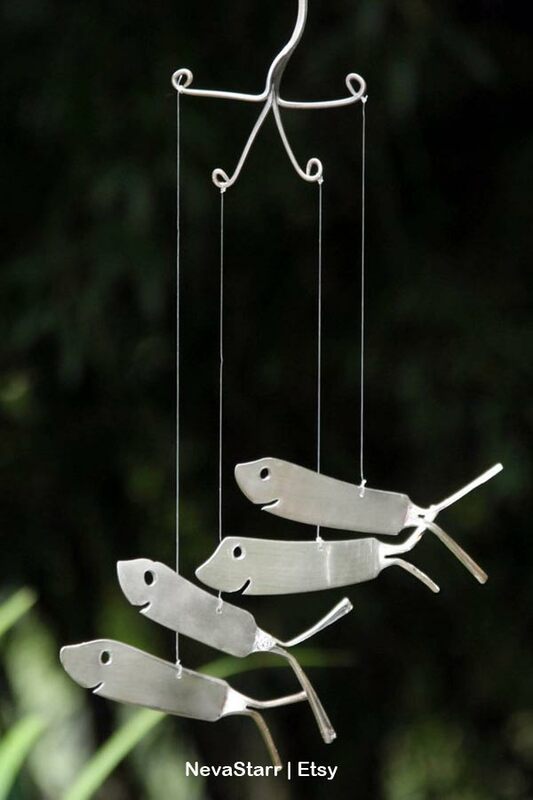 I think if you have one of these wind chimes, you need several! They look great all together. 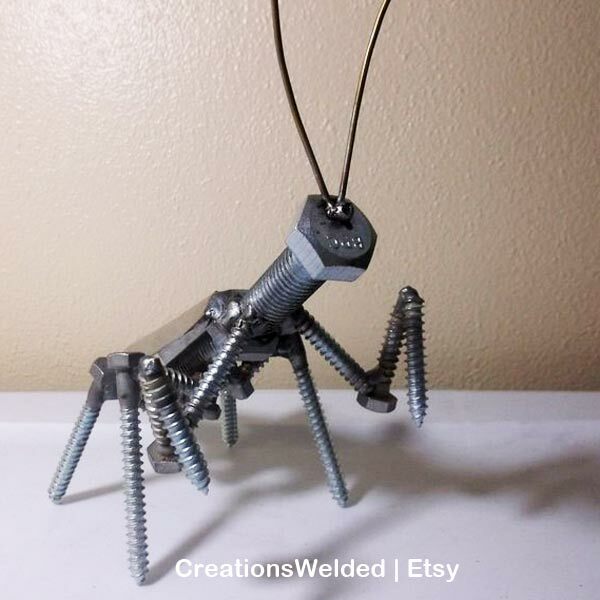 This Etsy shop has lots of sweet critters. I’d love a giant version of it in my garden. I watch for broken garden tools at the roadside for exactly this type of thing. 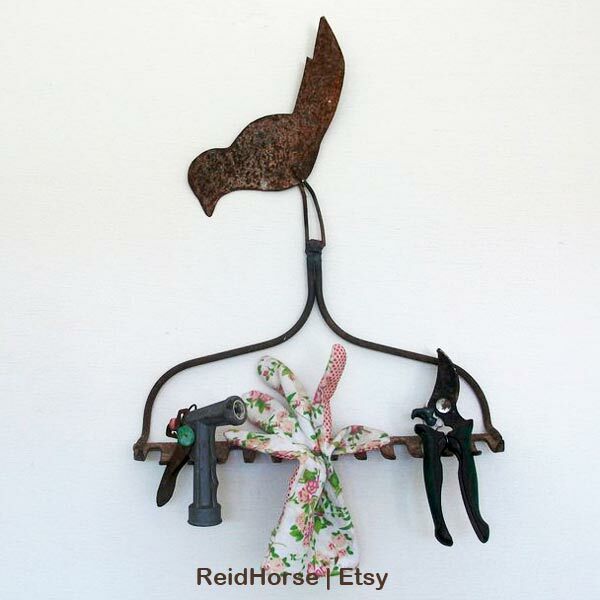 Old metal rake heads make great shelves and wall hangers. Here’s a little project you could make with a good adhesive. Adorable! 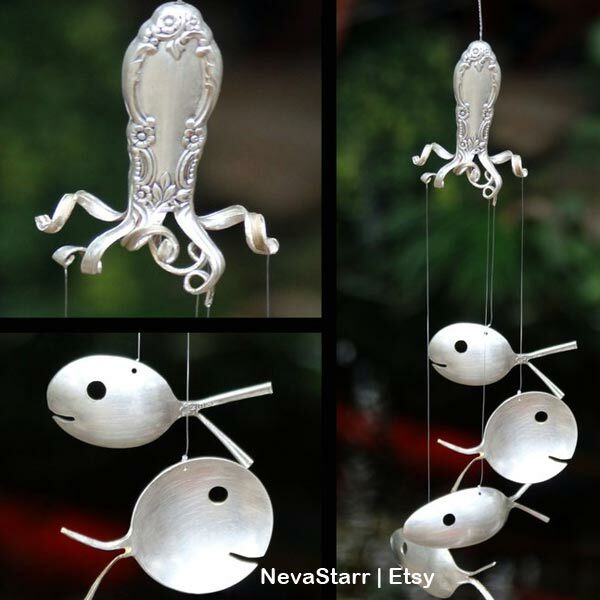 The top part that looks like an octopus is genius. Another fun way to reuse basic hardware. 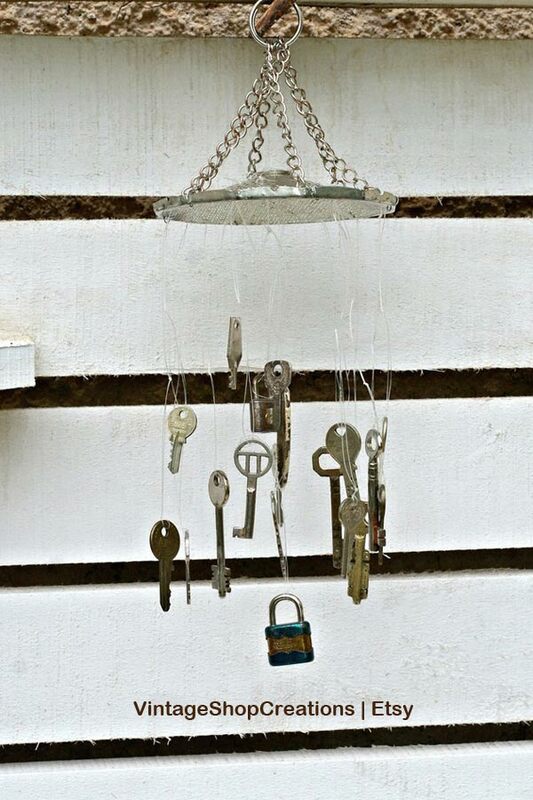 If you’re like me and hang onto old keys for absolutely no logical reason, this could be a way to give them a new life. More horseshoes! 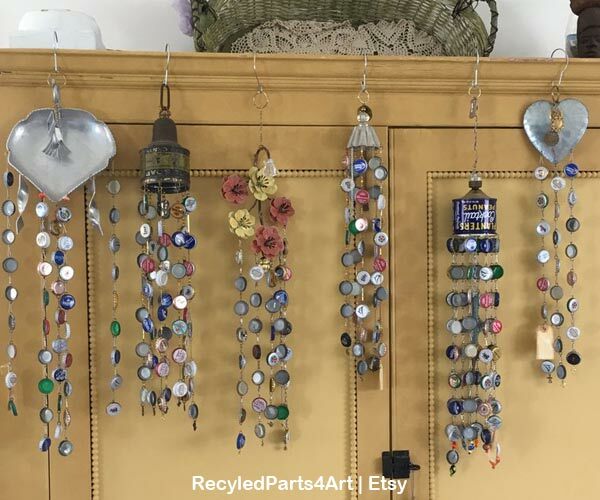 They have endless possibilities for repurposed art. The big decision is whether to paint them or let them get rusty. A favourite bird. 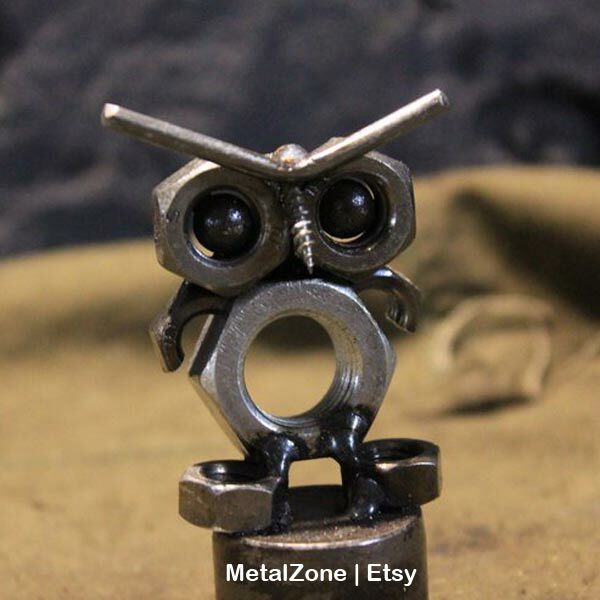 This one has nuts, bolts, and knife ends. There are a couple things I love about this one. 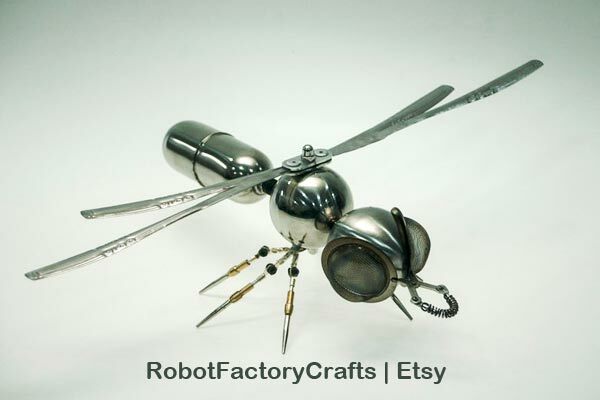 The big bug eyes with sieves, the bulbous body sections, and the way the wings are helicopter-ish. Cute alert. He’s goofy and slightly robot-like and perfect. 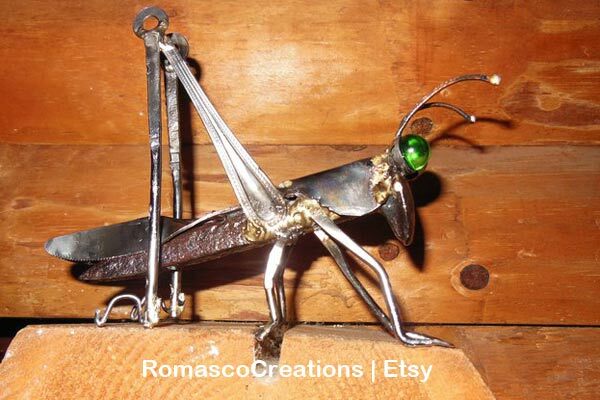 The photo isn’t great but it’s a really sweet grasshopper. Love the big green eyes. I think these two are made for each other. 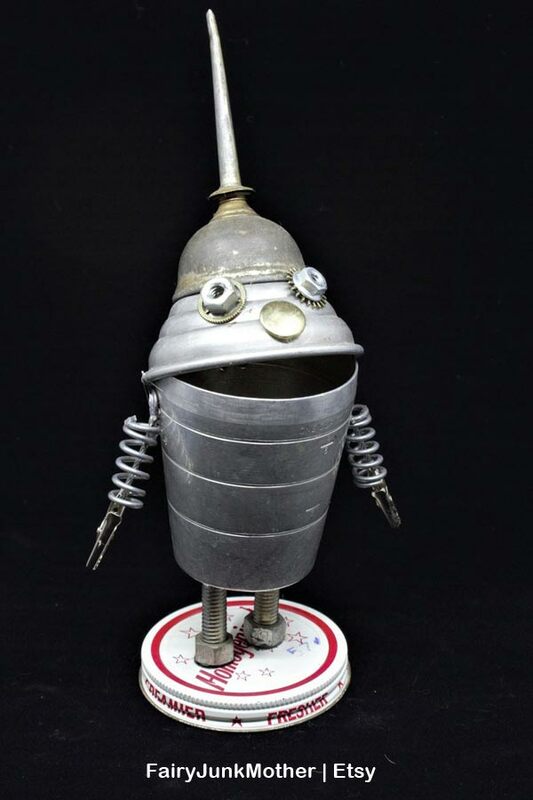 There are more steampunk-robot examples like this here. So well done! The broken scissors work perfectly. 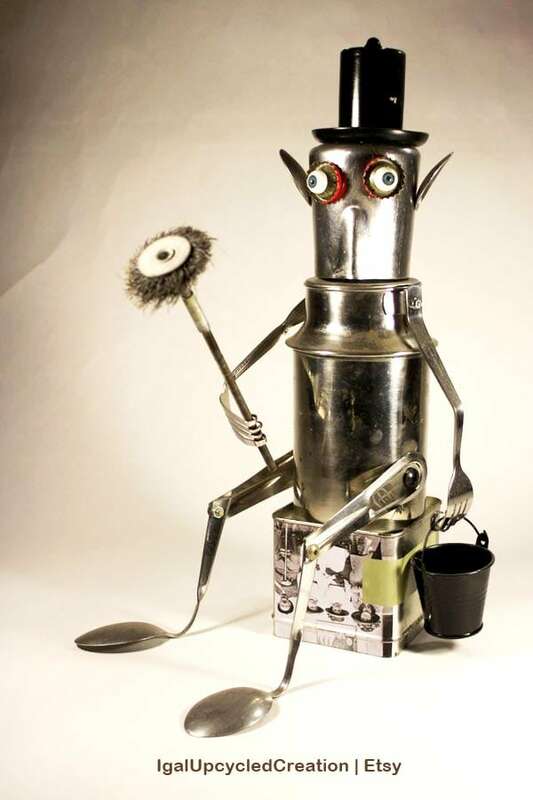 He’s ready to clean! Love the cleaning tool in his hand. Lots of recognizable parts on this one. The clip makes a great beak. I hope you’ve found lots of ideas. Be sure to visit the shops. Many of these sellers have many other similar items.